For Tesla Motors, part of Founder Elon Musk’s self-professed vision has always been a more sustainable kind of transport for the world. That vision looks to be a step closer with Tesla’s unveiling of its new solar-powered Supercharger network of fast-charging stations. Yes, that’s right, solar-powered. The point of Tesla’s new fast-charging network is to enable long road trips in high performance electric cars without long stops to recharge along the way. Tesla has developed a charger that delivers more power at a faster rate to the car battery. 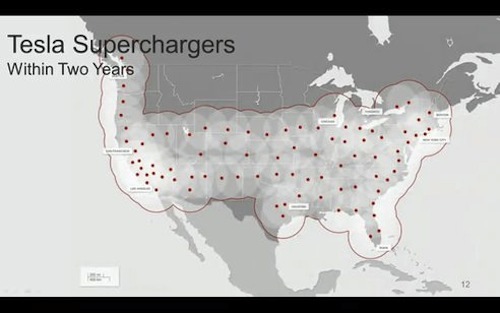 Indeed, a video stream demo from Tesla revealed that the Supercharger was adding a mile of charge time for every few seconds of charging. 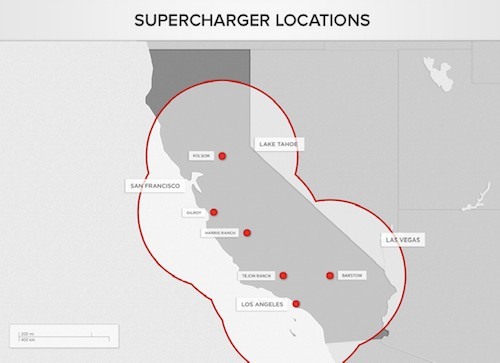 To begin with, Tesla has placed 6 Superchargers along well-traveled routes in California. The plan is to expand this to over 100 stations around the country by 2015; impressive, if Tesla manages to to carry out the plan. Even more impressively, Telsa has its sights set on Europe and Asia later as well. It’s a typically bold plan from Tesla and Musk. At present, the network of 6 stations stretches from San Francisco to Los Angeles, with one between San Francisco and Lake Tahoe. 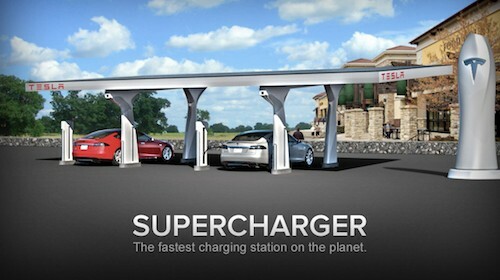 The Superchargers are located at roadside diners, cafes, and shopping centres, so there’s something to do while you wait for the car to recharge. Tesla maintains that the charging will “take minutes, not hours”, as is the current situation with electric cars. 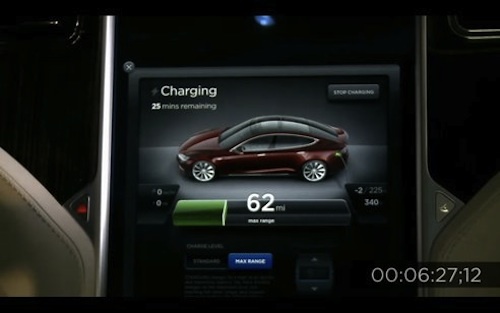 Model S drivers can expect to add 150 miles of driving range in 30 minutes of charging, for free. The Supercharger stations are powered by carport rooftop solar installations, and Tesla asserts that they will create more power annually than is needed to charge Tesla cars. Musk stated during the launch event that “You’ll be able to travel for free, forever, on pure sunlight”. Not a bad deal at all, once you’ve bought the (rather expensive) Tesla Model S.
All car driving could be like this, and perhaps it will be, one day. Tesla is certainly setting the bar high for other electric car manufacturers. If Tesla is successful, other companies will have to build out charging networks at well, and perhaps deliver power for free. That’s a win for drivers.